The east side of Main Street. Town, pop 532, located just S of Moose Mountain Provincial Park, west of Carlyle on Hwy 13. The first settlers arrived in the area in 1882, and within a few years churches, schools, post offices, and stores were scattered about the countryside. By 1901, as the first trains arrived, the community was large enough to be incorporated as a village. Arcola would remain at the end of the rail line for the next few years, and thus prospered as an important link during this period of large-scale immigration and westward expansion. Many fine buildings were erected in the community in the early years; five of these have since been declared heritage properties. 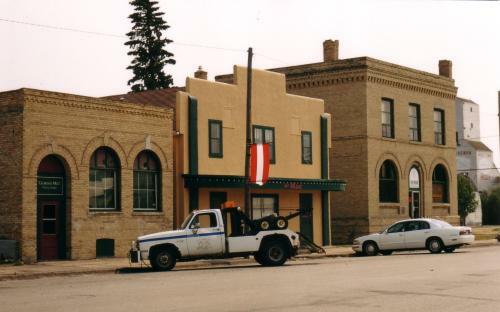 These well-preserved early-20th-century buildings typifying the quintessential prairie town led filmmakers to choose Arcola as the setting for the 1976 filming of W.O. MITCHELL’s Who Has Seen the Wind . Arcola is also distinguished by another literary link: SINCLAIR ROSS worked in Arcola between 1929 and 1933, and it is believed that during this time he began his Canadian classic, As for Me and My House . The Arcola area became well known for its quality livestock quite early. One of the earliest homesteaders, Isabelle Rogers Bryce, became an internationally acclaimed breeder of heavy horses: Canada’s only woman exhibitor at the International Livestock Exposition at Chicago in 1924, she won a grand championship with her Clydesdale mare, “Doune Lodge White Heather,” the first time in the history of the show that the prize went to a woman. Today, the oil industry is a significant part of the local economy, with pumpjacks dotting the district. Each summer, Arcola hosts an Annual Rodeo and Fair.